A large percentage of Minnesota’s local highways were built in the 1950s, the same era that birthed the modern interstate system. But the golden age of highway construction has caught up to counties, who are struggling to maintain and rehabilitate aging road systems with fewer and fewer dollars. “Our economic resources do not meet the financial investment needed as the bulk of our pavements surfaced in the 1950s reach the end of their useful life all about the same time,” said Freeborn County Engineer Susan Miller. In rural Otter Tail County alone, the cost of road construction has climbed 10.5 percent per year for the past 10 years. Meanwhile, there has been only one increase in funding — an 8.5-cent bump in the state gasoline tax “that was eaten up the moment it was enacted,” said County Engineer Rick West. 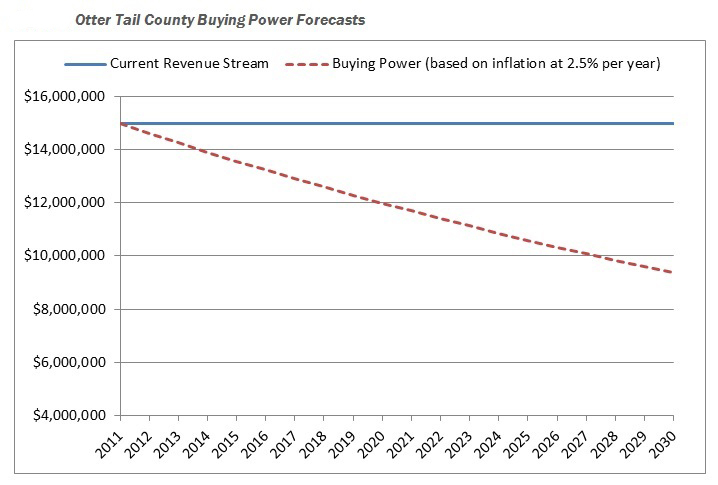 Otter Tail’s funding gap? An estimated $11 million in year 2011 alone. With no change in sight, counties across the state are banding together in a research project through the Local Road Research Board to identify ways to reduce the size of their road systems and lower preservation costs. The LRRB launched the study at the behest of counties who were considering turning some paved highways back to gravel just to get by — even though it would probably increase long-term maintenance costs. In addition to providing expertise on that topic, consultants worked with a group of pilot counties to develop other strategies of stretching county road dollars further. These include: changing maintenance schedules; using different gravel road materials; transferring roads to city or township ownership; adopting different road performance measures; and raising local revenue. “This project of how five different counties approach funding limitations and how to manage a system with constrained resources is one of the best that I have been a part of through the LRRB,” said Miller, who found the data critical to convincing her county board to pass a wheelage tax. Although the ideas developed through the study aren’t entirely new, for a busy county engineer with few staff, the assistance to implement them has been very valuable. The LRRB selected pilot counties (Dakota, Otter Tail, Freeborn, Stearns and Anoka) that reflect the diversity of the state. After researchers help them implement their chosen strategies, they will hold informational workshops for others throughout the state. Anoka County, for example, undertook a detailed analysis to determine which roads should become city-owned and which roads the county should assume. The evaluation system used by Anoka, which examines travel data and other factors, could be adopted by other counties. While some ways of changing the system of road maintenance may not be immediately popular, the community will get on board if they understand why, said Otter Tail County Board Chairman Wayne Johnson. For instance, Otter Tail had to explain why it’s more cost-effective to sealcoat four-year-old roads than reconstruct beat-up, low-volume roads. “That’s hard to get your arms around when it’s been the other way for 50 to 60 years,” Johnson said. Community residents did, however, reject one possible strategy discussed at eight public outreach meetings: unpaving roads. Otter Tail’s entire county road network is paved — a reflection of investments made back in the 1950s that have become somewhat of a community ethic for Ottertail’s 57,000 residents (a population that triples during the summer). Tools used in the study enable counties to illustrate just how far behind they are in terms of maintenance and prioritize where to make improvements. “Everyone wants roads to be maintained, but until the road system preservation study, nobody understood the magnitude of the funding gap between where we are and what we need to do to preserve the system,” said Johnson, who recently shared his county’s findings at the National Association of County Engineers conference. The data is critical for the public to understand why a county might seek a local tax or different method of road maintenance. The project findings will be completed later this year and available on the LRRB’s website.